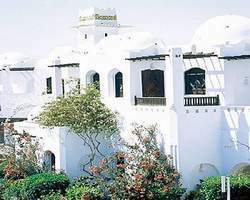 Located directly on the shore of the Red Sea just 3 km away to Hurghada town center and only 10 km from the airport. The Iberotel Arabella Hotel features 294 guestrooms all of which include a balcony and picturesque views. Serves international breakfast and dinner in buffet style, light and fresh international cuisine. Italian and Mediterranean cuisine offered in buffet style. Offers international healthy cuisine in buffet style.